Matthias Merges is one of the most important figures in the rise of Chicago to its status as a world-class culinary capital. If he doesn’t have quite the Olympian profile of a Rick Bayless or Paul Kahan, it is because he spent a sizable chunk of his career (1989-91, 1996-2010) working for one of the restaurant world’s larger than life figures: Charlie Trotter. 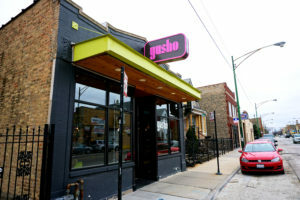 But after a 14-year stint at Charlie Trotter’s in Chicago’s Lincoln Park neighborhood — the last 12 of those as the world-renowned restaurant’s chef de cuisine — Matthias went out on his own in 2010, and soon after opened Yusho, focused on Japanese street food, in a slightly out of the way residential portion of the rising Logan Square neighborhood. 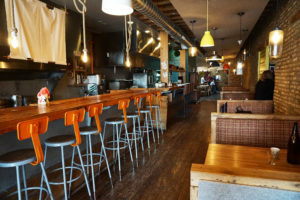 An immediate hit with critics and diners, Yusho soon begat Yusho Hyde Park in that South Side neighborhood (and Yusho Las Vegas); Billy Sunday in Logan Square, famed for both its beverage program and food; A10, a Hyde Park restaurant with French and Italian influences; and Old Irving Brewing, on Chicago’s Northwest Side, a brewpub with a strong culinary sensibility. These restaurants make up Matthias’ Folkart Restaurant Management group. Matt also wears his commitment to a better society on his sleeve. It was his decision to make Charlie Trotter’s the first restaurant to buy produce from the urban farm run by nonviolent offenders participating in the Cook County Sheriff’s Garden Program. He is one of the co-founders of Pilot Light Chefs, a program that helps Chicago Public Schools integrate food education into the curriculum of elementary school students. And he now has an exclusive arrangement to purchase the hyperlocal produce grown on a quarter-acre plot by Planted Chicago on the Legends farm that the Chicago Botanic Garden‘s Windy City Harvest program operates in the South Side’s Bronzeville neighborhood. Good Food on Every Table is dividing Matthias’ answers into two segments: the first reflecting on Chicago’s Good Food restaurant scene here, and the other on his social mission (Monday, April 3). 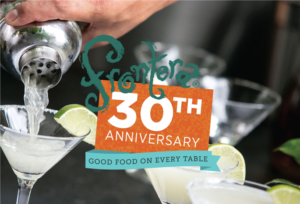 And you can meet Matthias at the Frontera 30th Anniversary Celebration, a joint fundraiser for Chef Rick Bayless’ Frontera Farmer Foundation and FamilyFarmed, which will take place on Sunday, April 30 at the Art Institute of Chicago. FamilyFarmed: Let’s take a step back to when you were starting at Charlie Trotter’s. Where was Chicago culinary culture and food culture then, especially when it comes to what we now call the Good Food movement. 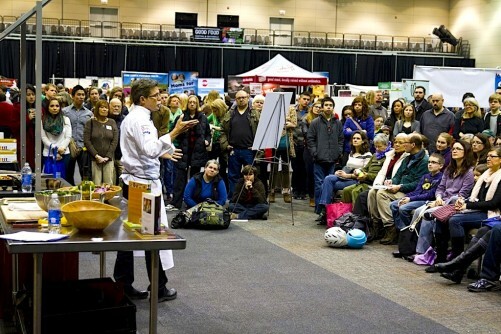 FamilyFarmed: Rick [Bayless] says the farmers would basically go door to door with samples. FamilyFarmed: Once I started learning about the business, I thought at some point, because demand is outstripping supply to such a degree, places were going to have to move more towards a vertical integration system. You’re already doing that and some folks like you at Trotter’s and your ensuing restaurants, Rick Bayless, that’s how Frontera Farmer Foundation came about. Matthias: That’s exactly right. When we started working with Greg and we were really close with Rick, then he started using that pork, and Greg now produces all the pork for all of his properties and his line of food and his airport expansion. It’s great how that all materialized. FamilyFarmed: When Gunthorp showed up with that pig, were you already moving in that direction in terms of trying to get more local sourcing? Matthias: Definitely… The kind of the directive I gave the cooks and everyone, we have to source the best product we possibly can get, and the best product usually came from the smallest producers because it was hands-on, it was a very intimate setting on a small farm rather than a big production farm. FamilyFarmed: It all comes down to the ingredients. Matthias: Exactly right. That’s the same philosophy we had. What we tried to preach in the kitchen is take your ego out of it, it’s not about you, it’s about the product, and you’re the messenger from the farm to the plate, you’re going to take it from this point and you’re going to bring it to this concept and this point on a plate where people can identify with it, you’re no longer part of that transaction…. 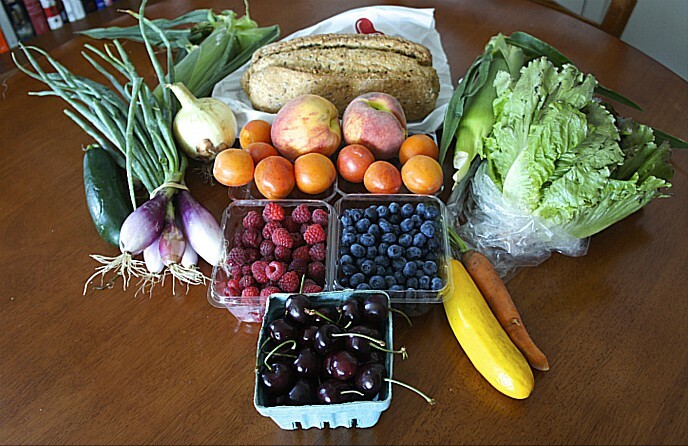 FamilyFarmed: How did the rise of the farmers market culture here in Chicago abet that? Matthias: The great thing about farmers markets and chefs is now you have a place where a chef whose schedule is very demanding and you’re working all the time, now there’s a collective of farmers and purveyors in one location where you can scout. You can say, I really love the philosophy behind what they’re doing here, I love their product, let’s focus in here and start nurturing a relationship and going from there. 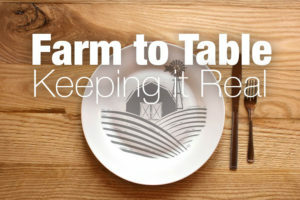 FamilyFarmed: Charlie Trotter’s has this reputation as a cradle for chefs. Charlie got the credit, but obviously as chef de cuisine for 12 years, you shaped a lot of those people yourself. How do you turn someone from a cook into a great chef? FamilyFarmed: Then you went out into this world and you decided to strike out on your own. There were a lot of different directions you could have gone. 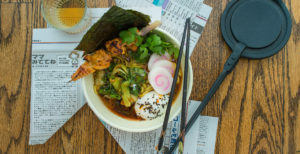 How did the idea for Yusho come about? Why Japanese? Why this neighborhood, which is a little off the beaten path? Matthias: For me, I was in fine dining since 1986. It came to a point where I understood the rhythm, I understood what needed to be done, I kind of got it. I said to myself, I have to shake it up a little bit and challenge myself in other ways. Looking at the future, what does that mean. 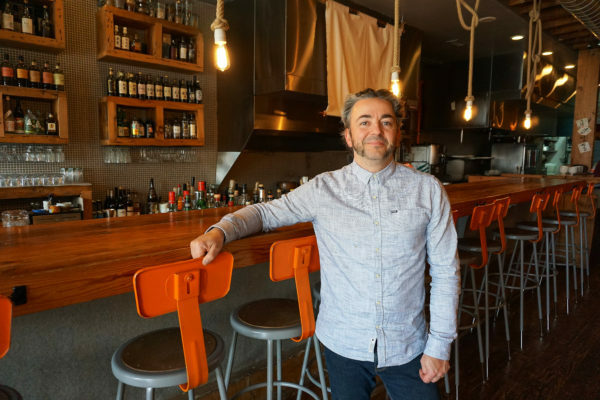 I wanted to get back to having fun, taking what I call the truths of fine dining, knowledgeable, attentive waitstaff, a great beverage program, really well-crafted food in a really interesting and fun environment… We open restaurants as an expression of things that we love. 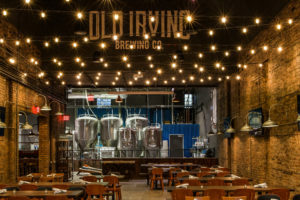 FamilyFarmed: And Old Irving Brewing…What we’ve seen is a merging of these cultures, so a chef like yourself will take the brewery concept, apply that culinary sense to the beers themselves, and then create a menu that is bar food. Matthias: We developed this menu that has nods to the beer food culture of the past, done in an interesting way with twists, but also giving some things that are unexpected and delicious. We’re hanging ducks above a wood-fired grill, we’re cooking lamb shoulder on the bone, we’re doing whole animals outside, there’s so many different things that we do. It’s a new look at something. FamilyFarmed: So when you create a blood orange saison, people don’t give you a funny look. Matthias: I think it’s just applying this open mind and this culinary mindset to brewing beer… It’s about an exploration mindset and it’s about risk taking. Especially in the culinary community in Chicago, there’s a lot of great risk taking that is happening and people aren’t afraid to fail, which I think is key to business. You have to fail in order to learn and then become stronger as a unit as you move forward. FamilyFarmed: When you look at a place like Logan Square, Hyde Park, Avondale, other neighborhoods like that, we see the power for Good Food to contribute to powerful economic growth and community revitalization. Matthias: One of our pillars, foundations of our group itself is that all of our places are in neighborhoods around the city. We always want to hire, 70 percent of everybody who works in the restaurant lives within walking distance or close on public transportation. 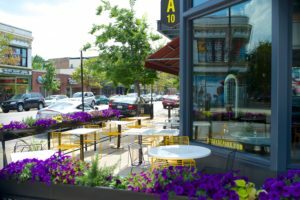 We joined the Chamber of Commerce in Hyde Park or in Logan Square, and we become members of the community. Restaurants, especially, and bars, churches, schools, they are the fabric of the community. They are meeting places… We’re not dictating to anyone who walks into one of our restaurants that you need to do this, you need to order this, this is what you’re going to have. We’re going to set the stage, we’re going to give you the opportunities and the options to control your own destiny, we’re going to give you kind of that platform for celebration or whatever you’re coming in for to happen. Matthias: The middle has filled in. That’s exactly right and that was something in Chicago that was missing, and that had to do with the exodus from the city in the 80s, when people moved to the suburbs. Now there’s a resurgence of people moving back into the city, the economic development, I think there are so many factors that played into creating the environment to give us the opportunity to do what we do. This entry was posted in Chef activism, Chef advocacy, Culinary Trends, Direct Farm Marketing, Ethnic foods, Farm to table dining, Farm to Table: Keeping It Real, Farmers markets, Food activism, Food and community, Food Entrepreneurs, Frontera 30th Anniversary Celebration, Frontera Farmer Foundation, Good Food and economic development, Good Food business development, Good Food Dining, Good Food restaurant trends, Good Food Success Stories, Local Food, Restaurants and Good Food, Sustainable dining, Urban farming and tagged A10, Billy Sunday Chicago, Charlie Trotter, Chicago Botanic Garden, Cook County Sheriff's Garden Program, FamilyFarmed, Folkart Restaurant Management, Frontera 30th Anniversary Celebration, Frontera Farmer Foundation, Frontera Grill, Gunthorp Farms, Matthias Merges, Old Irving Brewing, Paul Kahan, Pilot Light Chefs, Planted Chicago, Rick Bayless, Rob Levitt, The Butcher & Larder, Windy City Harvest, Yusho Hyde Park, Yusho Las Vegas, Yusho Logan Square. Bookmark the permalink. Great articles about a great chef whom I have had the pleasure of knowing for many years! Not only an extraordinary chef and influence in the local, regional, and national culinary “scene”, Chef Matthias is a caring human being who has dedicated his expertise and persona to the betterment of humanity, especially children through his Pilot Light Chef’s Foundation. I had the pleasure of working alongside him, and the talented Trotter kitchen crew, as a self-invited “stosh” cook for more than a decade. Taking a week at a time, I’d travel to Chicago, park myself at a nearby B&B and trudge into the kitchen at 0600 to begin prep, peel potatoes, keep busy through the evening service, and participate in the kitchen and front-of-the-house clean-up after a busy, taxing, and most educational day of feeding all who entered for the special repas and experience that was Trotter’s in its heyday. Matthias has certainly continued to grow in so many ways, and I look forward to dining with him, and having the insightful conversations which have become a part of our friendship. Only wish I could attend Rick Bayless’ celebration of his 3 decades in Chicago. Thank you for your very kind comment, I will be happy to pass it along to Matthias. We wish you were able to attend the Frontera event as well.